Today I have such a fun Halloween project to share with you! 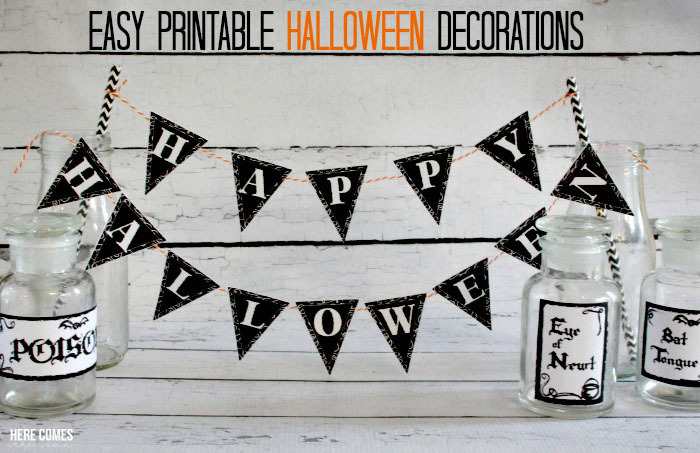 I’ve created some easy printable Halloween decorations using printables from Jen Goode. If you know me, you know that I am all about printables! I love them so much that I opened an Etsy store where I sell them. Printables are one of my favorite things to craft with. In addition to the printables that I sell, there are so many free printables available and all you have to do is print and cut and you have instant decor. 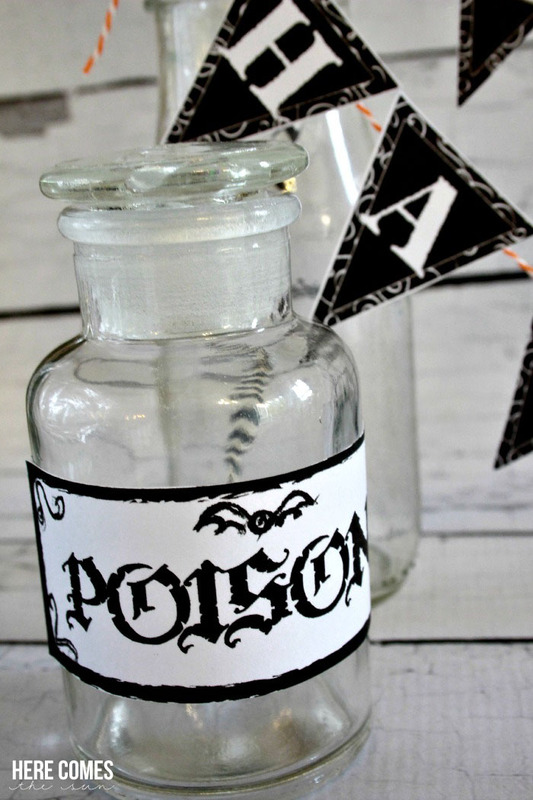 To make these easy Halloween decorations, head on over to Jen’s site to download the potion labels and the doll size banner. 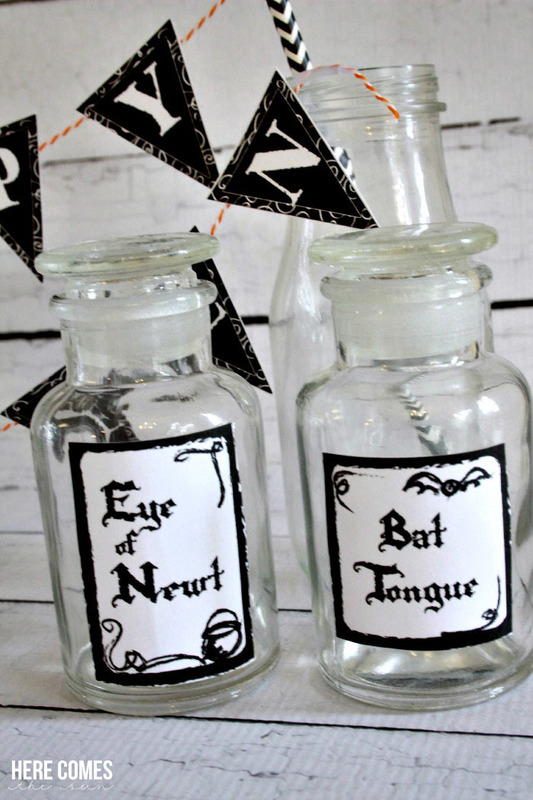 Print out the potion labels and attach them to small glass jars. 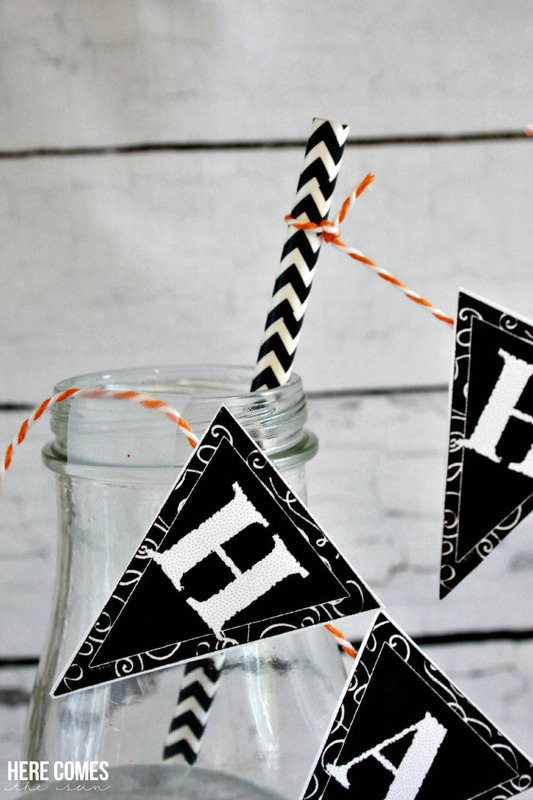 Print out the doll size banner, cut out the triangles and attach them to bakers twine with pieces of tape. Tie the ends of the bakers twine to paper straws and place each straw into an empty glass bottle (I use the Starbucks Frappaccino bottles). Tape the “Halloween” banner onto the bottles. This would be adorable to use for a Halloween party. Make sure to stop by Jen’s site to download the free printables! She’s got lots of different Halloween printables to choose from in both color and black and white. *This post contains affiliate links. By purchasing products through these links, you help keep this blog running. I LOVE how your jars turned out and the banner hanging from straws is adorable! Thank you so much for joining in and sharing your creative ideas! Thanks, Jen for the awesome free printables!